Pennsylvania's flag features the state coat of arms on a field of blue. The state motto appears on a ribbon at the base of the design ("Liberty, Virtue, and Independence"). Draft horses are on either side of the coat of arms and the American eagle rests on the top. Our Pennsylvania Flags are made to accuracy and precision from premium quality fabric including nylon and polyester. 100% made in USA, our commercial grade flags enjoy 6 months guarantee on construction.Shop from our complete line of Pennsylvania Flags right away and avail the best prices, quick shipping and much more! 100% customer satisfaction guaranteed! Pennsylvania Flags from Tuff Flags is a perfect way to show your state pride and the love for the eclectic profile of this great state. 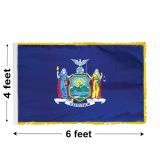 Our flags are available in all standard sizes that range right from the compact sizes of 3’x5’ to the eye popping 8’x12’ and everything in between to cater to all your flag display needs. Choose from 200 Denier nylon or 2 ply polyester flags that are finished with grommets and heading and featuring colorfast Dupont inks. 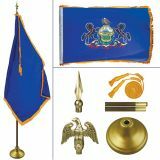 Apart from outdoor and indoor flags, we also have elegant Oakwood indoor flag kits that include everything from poles to ornaments and gold chord to make a dazzling flag presentation to impress your audience. Made to the exact specification of the official flags, these will make perfect gifts, collectibles and flag display items. 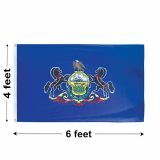 Browse our complete line of Pennsylvania Flags at attractive rates. Should you need any assistance, call our toll free number (888) 287-3524 or email at customercare@tuffflags.com.